He has training as a first responder, but he was acting on instinct. Those are the words used by the young man who pulled Philadelphia police officer, Mark Kimsey from his burning cruiser Saturday evening. Seventeen year old Joe Chambers is being hailed a hero after witnessing an accident involving the police car and another vehicle. Officer Kimsey was trapped inside his burning car when Chambers jumped into action. Officer Kimsey is expected to be okay. Federal kidnapping charges have been filed against Delvin Barnes, the suspect in the abduction of Carlesha Freeland Gaither. Gaither was rescued and Barnes arrested by U.S. Marshals after a coordinated effort by Philadelphia police and the FBI in Jessup Maryland. Barnes has a rap sheet that is over 30 pages long full of charges from Pennsylvania and Virginia. The 22 year old woman abducted in Germantown has been rescued and reunited with her family. Carlesha Freeland-Gaither was forced into a car Sunday night in Germantown. A team of U.S. Marshals in Jessup, Maryland apprehended her suspected abductor, Delvin Barnes, a 37 year old who also has an outstanding warrant for attempted murder and other charges in Virginia. 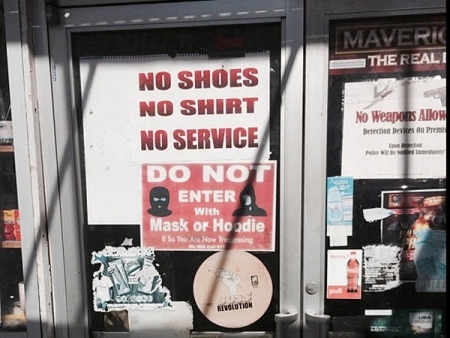 There is growing controversy over bright red signs in the windows of some Philadelphia retail stores that say "Do Not Enter with Mask or Hoodie" (pictured). The signs are an attempt to curtail robberies. However, opponents say they are a form of racial profiling. The signs were introduced by a Mount Airy-based businessman who started to sell them two years ago to help stem the tide of holdups. 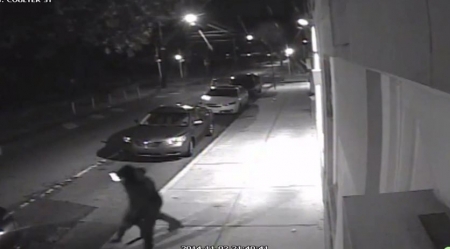 Philadelphia police are looking for a 22 year old woman who was forced into a car last night in Germantown. Carlesha Freeland Gaither was last seen being forced into a dark colored sedan on the 100 block of West Colter street. She was wearing a blue denim jacket, a grey and white sweater and carrying a black backpack. Gaither is a black female, 5'3" tall, 125 pounds. Anyone with information should contact police. An arraignment hearing is being held this morning for accused cop killer Eric Frein who was arrested last night. Frein's arrest after a 48 day manhunt will now move to the courts where prosecution will seek the death penalty for the capital crime. Meanwhile, residents and businesses in the Poconos are breathing a sigh of relief. And Halloween is back on for tonight! Police in Moorestown New Jersey are looking for a man who exposed himself to children on a school bus. The incident occurred while the bus was stopped at a light on its way to Moorestown Upper Elementary School. Two children, fourth graders, saw the man in a car alongside the bus expose himself. He is described with a moustache and beard in his 30’s or 40’s driving a grey sedan, possible a Honda or Acura. At a meeting last night at CB West, parents lambasted the school board for their quick decision to cancel the football season and tarnish Central Bucks West's image over alleged player hazing incidents. The coaches were suspended and last two games for the storied football program cancelled after the board learned of hazing following a pre-season scrimmage in August. The alleged incidents took place after coaches had gone. Philadelphia SPCA officials may be on to a South Philadelphia dog fighting ring. After a tip from a neighbor, they searched a property on the 2200 block of Mifflin Street and found 15 dogs, including eight puppies. Officials also discovered training equipment like specialized treadmills, and syringes that may have been used to inject the dogs with steroids. The dogs will be heading to the PSPCA where they will be checked out, and hopefully rehabilitated and adopted.